Turkish President Recep Tayyip Erdogan on Wednesday accused Russia of siding with Armenia in the resurgent conflict with Azerbaijan over the disputed territory of Nagorny Karabakh, saying Moscow was meddling as it had in Ukraine and Syria. Erdogan's comments are likely to further fuel tensions between Turkey and Russia, whose relations drastically deteriorated after Ankara downed a Russian warplane near the Syrian border in November. Erdogan also accused Armenia of not sticking to a truce with Turkey's ally Azerbaijan in Nagorny Karabakh, which was captured from Azerbaijan by Armenian separatists in an early 1990s war. "I hope the steps taken by Azerbaijan to end fighting will be imitated by Armenia, but this is not the case right now," said Erdogan. The Turkish strongman has already been accused of fanning the flames by expressing his support for Azerbaijan and declaring that "Karabakh will one day return to its original owner." "Russia says that Turkey is taking sides. If we are looking for someone who is taking sides, it is Russia," he said. "Russia likes taking sides, it has done so in Ukraine, Georgia and today in Syria," said Erdogan. Russia stands accused of fuelling separatist tensions and wars in both eastern Ukraine and the Georgian breakaway regions of South Ossetia and Abkhazia. It is also accused of siding with the Syrian regime by targeting opposition forces with air strikes rather than the Islamic State group. "You say you are in Syria at the invitation of the regime. You are not obliged to go there. 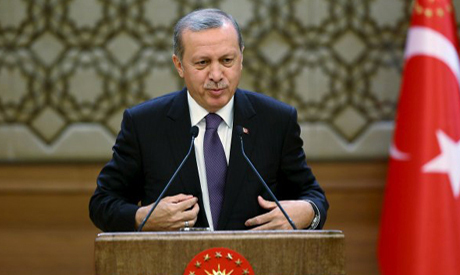 If you do, take the side of the oppressed, not the oppressor," said Erdogan. Russia has sought to portray itself as an honest broker in the conflict and Russian Prime Minister Dmitry Medvedev is set to travel to both Yerevan and Baku in the coming days. But Russia has close military ties with Armenia, which hosts a Russian base in Gyumri and is also tied to Moscow through the Collective Security Treaty Organization (CSTO) of ex-Soviet states which no longer includes Azerbaijan. Turkey and Azerbaijan also have a tight military alliance through the 2010 Agreement on Strategic Partnership and Mutual Support which commits both sides to use all possibilities in the case of a military attack. These opposing alignments have prompted some analysts to suggest the Karabakh dispute risks prompting a proxy conflict between Turkey and Russia who are already at loggerheads over the war in Syria. Erdogan the terrorist wants to operate with impunity. It's ok for Erdo to take sides but whines like a little boy if he has to deal with any opposition.